StubbyDog was lucky enough to meet Aubrey this weekend and if there ever was a dog born to become a therapy dog, to bring peace to whomever she is around, it is Aubrey. To say this dog is special is not enough. Surrounded by other adoptable dogs and people at an adoption event, she was so incredibly calm and allowed everyone to pet her while she laid peacefully near her volunteer. If there is someone out there looking to adopt a dog to do therapy work with, this is your girl. Read her full story below. She is located in the New Orleans area and is in need of a foster or forever home. 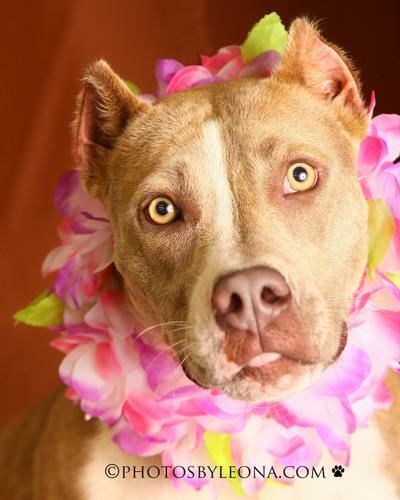 Jaws dropped when this supermodel walked through the front door of the shelter! Aubrey, a brindled fawn beauty was surrendered by her owner as he said he was moving and did not wish to take his canine companion with him on his next venture. He also signed a release to euthanize her, which baffled us. With not much info offered about her aside from living in a kennel in the yard, we went on our own quest to get to know Ms. Aubrey. She was very nervous, trembling in her kennel initially and it took some effort to coax her out. But, she licked our hand the entire way down the barky kennel corridor. When we reached the play yard outside, we had a lab friend waiting to play with her. We let them smell each other, entered the yard with her, she spotted a tennis ball, then that was it… lab and staffy became best friends! After spending several months at the shelter, her wait finally ended when a family with two young children adopted her. She spent a few months in her new home and became a therapy dog to one of the children, a little boy with autism. We received Christmas photos of our sweet girl and were so thrilled that she was so adored. Last month, Aubrey was abruptly surrendered to us by a very frazzled owner. Apparently, Aubrey’s dad worked months offshore and when he would return and discipline the children, Aubrey would interfere, placing herself in front of the children. She never showed any aggression whatsoever, she would just make sure the children were behind her, away from the stepfather. The man said, “it’s me or the dog,” and Aubrey returned to the shelter, with her world shattered. Aubrey lost her home, her children, and her purpose in life. To say that Aubrey is devastated is an understatement. She worshipped her children and her heart is very empty. She paces her kennel and is anxious. Aubrey is still the wonderful dog we fell in love with months ago. She loves everyone she meets, loves her tennis balls, and loves playing in the water. She is housebroken, fully vetted, good with dogs, and wants nothing more than to share her days with children. She is a true ambassador for pit bulls and will make any home a more inviting and loving place. Aubrey is so very sweet & beautiful. I met her this weekend at the adoption event and was impressed with her wonderful disposition and calm nature. She possesses an unique and valuable talent. Somewhere out there a family with an autistic child is desperately hoping for the love and confidence Aubrey can give to their family. Here’s praying they find her. Perhaps it was the step father who needed to “go”….. I’m just sayin’…that Aubrey deserved a helluva lot better than to be returned to the shelter and so did those children whom she loved so much. My prayers for Aubrey to find a home quickly and permanently.